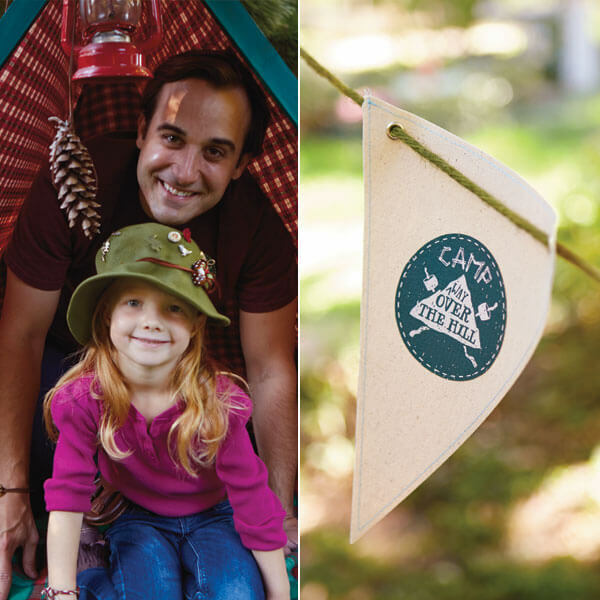 Here’s a birthday idea for the outdoorsy guy: “Camp Way Over the Hill.” Kids of all ages will love sending out invitations, mixing up Bug Punch, pitching tents and gathering sticks for tabletop decorations to celebrate the Camper of Honor. And the birthday guy will find himself too busy playing games, chomping on trail mix and making birdcalls to worry about being another year older. 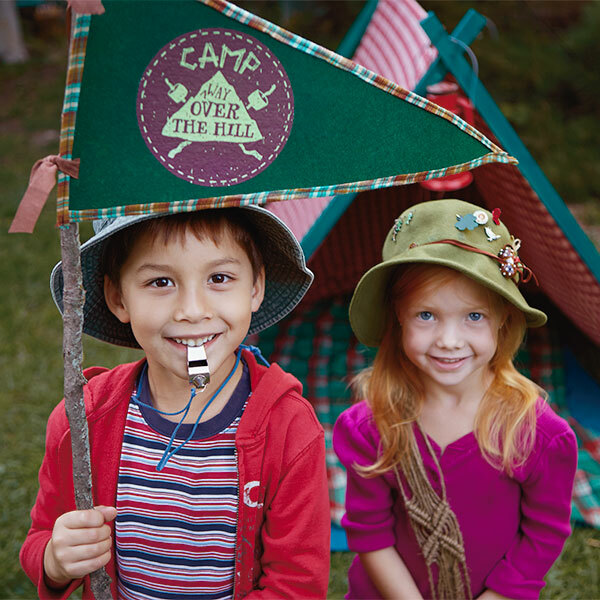 Usher your Camper of Honor in with all the pomp and circumstance of an opening ceremony. 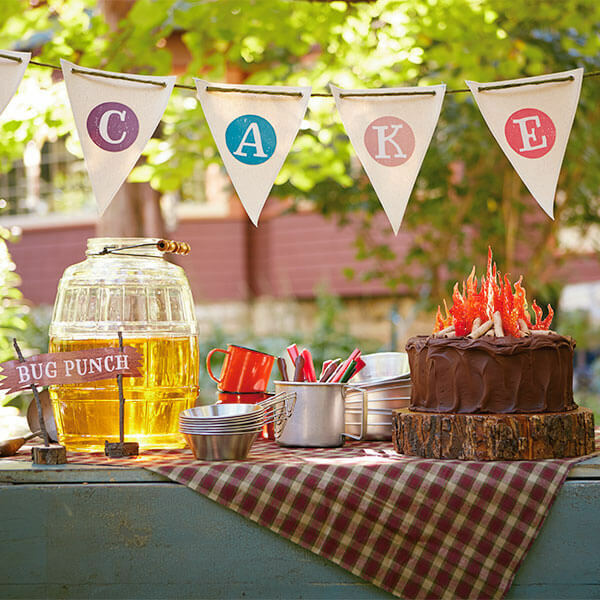 Raise a homemade flag high atop a twig flagpole, and let the birthday party begin! 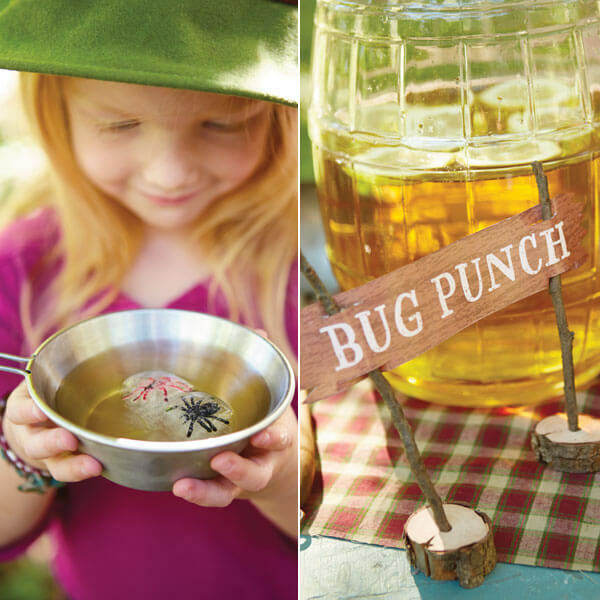 Serve your campers a big swig of homemade Bug Punch: ½ gallon apple juice, ½ gallon ginger ale, ½ cup fresh lemon juice and lemon slices. Serve with “buggy” ice cubes made with plastic bugs frozen in ice-cube trays. Then create a sign for your Bug Punch by gluing gathered backyard twigs into 1-inch-thick log slices (pre-drilled with holes). Then print out the sign, cut out, and slide it onto your twigs. 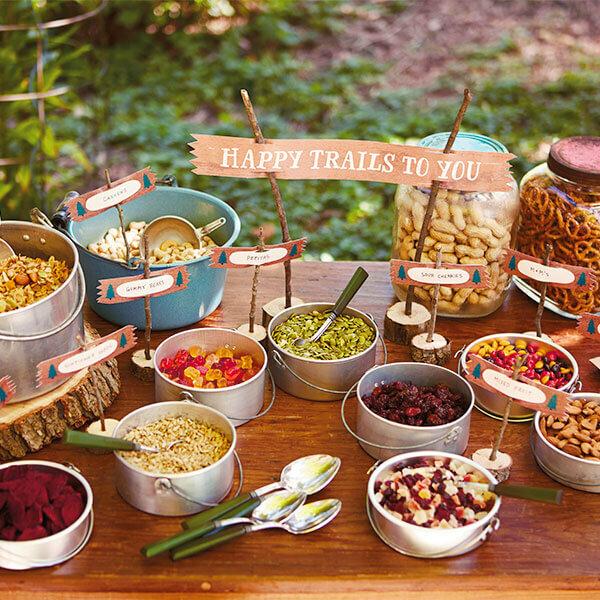 The trail mix sign (featured below) is made the same way. 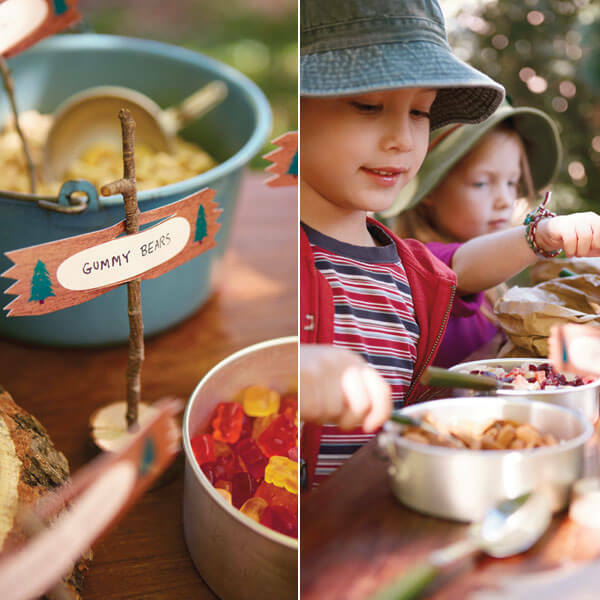 Set the stage for the birthday cake with vintage scout mess kits and camping equipment. Corral your cutlery with an aluminum pot and use a piece of plaid flannel for a tablecloth. To make the Cake Banner, decorate ready-made canvas pennants (available at craft stores) with the Cake Banner printables, then lace them onto rustic twine and hang the banner between two trees. 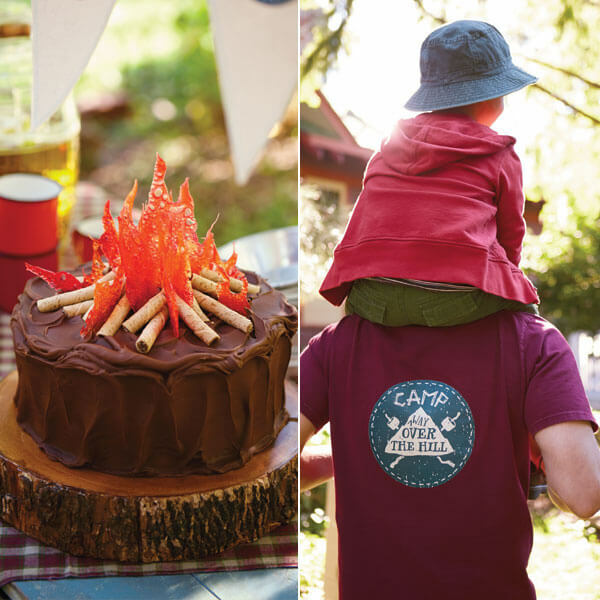 Serve up our chocolate Campfire Cake that’s topped with crackly hard-candy flames and rolled-wafer cookie logs—need we say “Yum?” And make your honoree a camp logo T-shirt (print the logo onto iron-on paper) to wear while you show off birdcalls and explore the wild backyard together. You probably won’t spot a grizzly, but chances are high for squirrel sightings! Use a flannel sheet to create a makeshift tent for photo ops and special secret camp meetings. 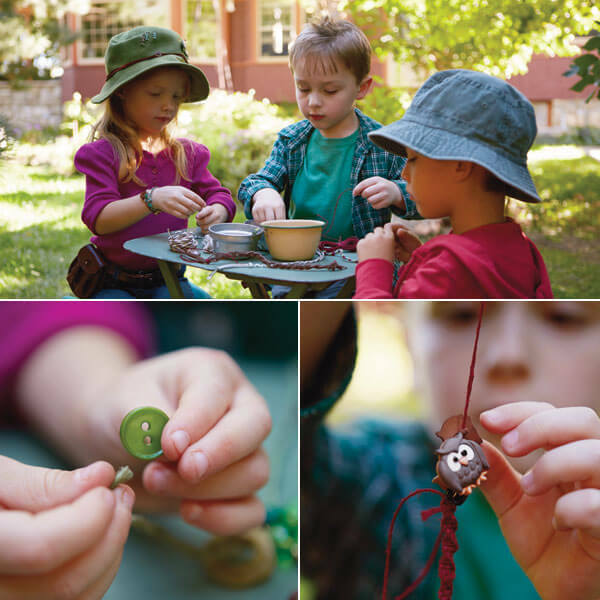 Create additional banners for all of your activity outposts—like popsicle-stick cabin crafting or a bird-watching table set up with guidebooks and a basket of binoculars. No camping is complete without trail mix! Use our tasty recipe, then let guests add to it with mix-ins of their choice. Post a sign to alert your hungry campers. For mix-in ideas, try sunflower seeds, dried sour cherries, pretzels, almonds, dates, pumpkin seeds and even gummy bears and chocolate candies. Blank labels let you write whatever ingredients you want—they even make great place settings. Then serve your grub in rustic (but clean) camp-ware pots and bowls. Mark the territory for another photo-op outpost with an old canoe. 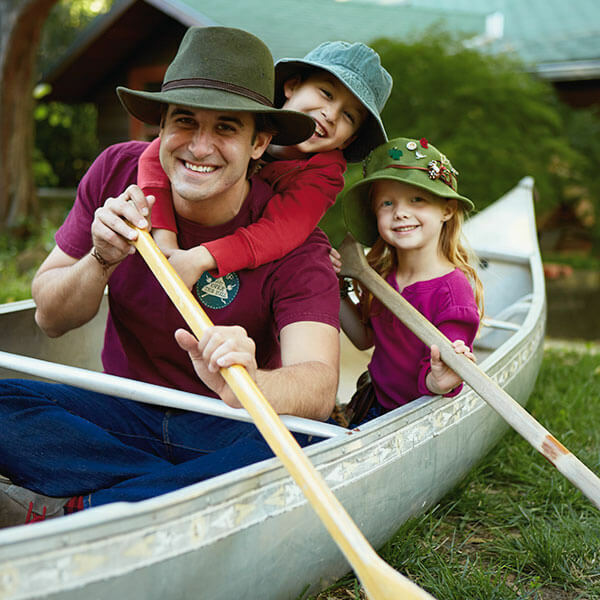 Forage for flannel shirts, camp hats, life jackets and more for outdoorsy props. 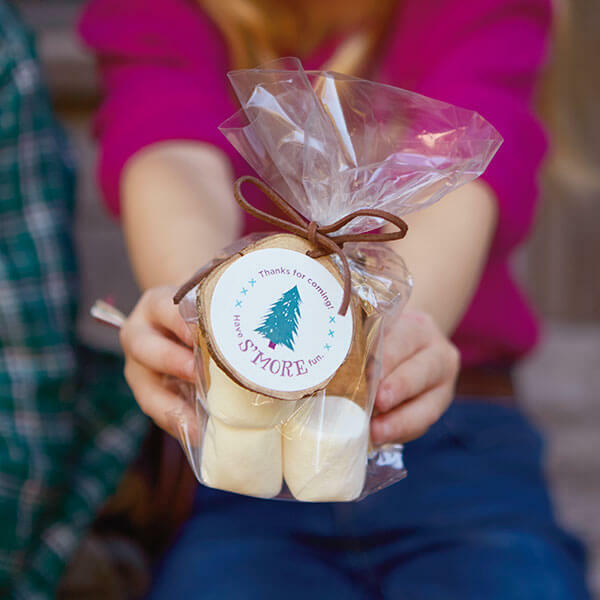 To make s’more kits, buy cellophane treat bags and fill each bag with 2 graham crackers, ½ of a chocolate candy bar and 3 marshmallows. 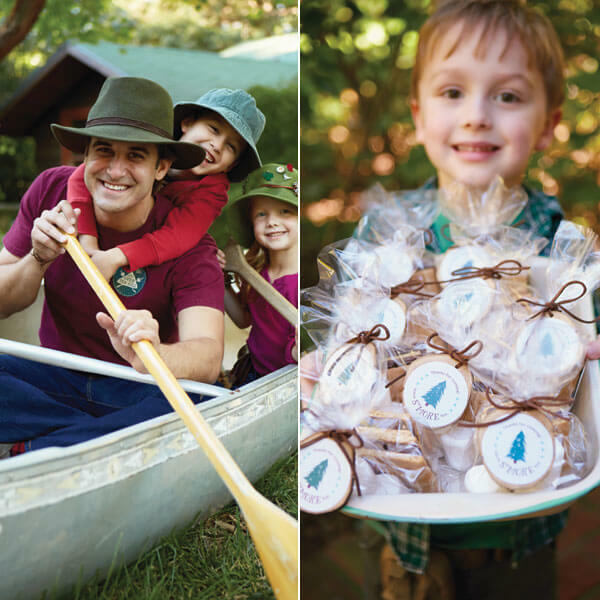 To finish them off, print our S’more Labels onto 2-inch-diameter labels and attach them to the bags. Secure with lengths of cord or twine tied into bows. 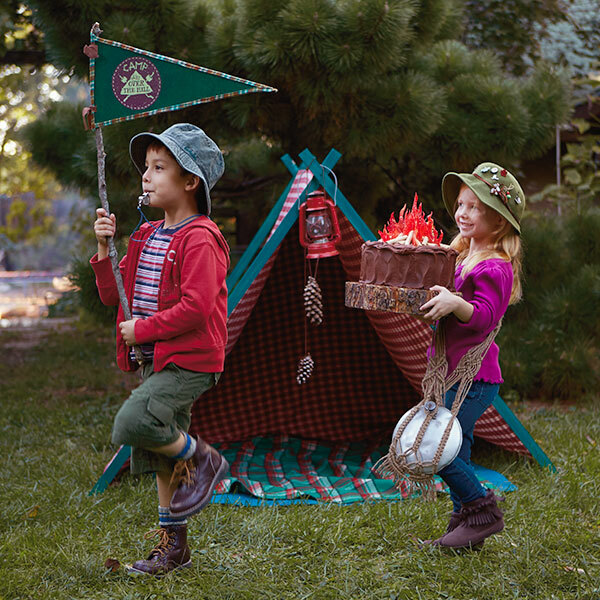 To salute your way-over-the-hill honoree, have a ragtag birthday brigade march forth with the Campfire Cake ablaze to the tune of “Taps.” (Use a toy trumpet and your phone or iPod for tunes).